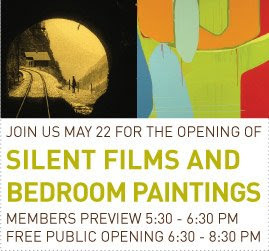 Check out the new exhibit at The Lab featuring the unique pairing of recent contemporary paintings with early silent nonfiction films. Bedroom Paintings refers to painting that aspires to immediate pleasurable effects. Silent Films shows films from a historic period but emphasizes the aesthetic power of the films versus its film history significance. The Lab will ask its viewers to reflect on the extent to which history matters when looking at images......yes, you need to see this in person. The Lab offers a beautiful space and they always puts on a qwerky yet sophisticated event. (Plus the people are pretty cool too.) Don't miss an opening at The Lab!